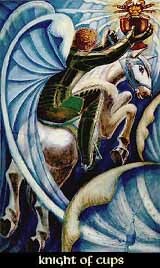 The Knight of Cups represents the Fire in the element of water, trying to bring the contrasts in balance, using the flaming fires to advocate the passive waters. Therefore, there is a certain unstability within this Knights' character, that can shift from one side to the other. Briah is the world of emotions and sensitivity, and the Knight of Cups might have good senses for art, poetry and lyric, his compassion can make him a good healer. If he manages to reach real depth and inner conviction, he will be able to provide rich tenderness and emotional warmth. On the shadow side, his quickly rising emotions could be overwhelming, but without depth and reliability, when the fires of spontanity won't be able to harmonize with the depth of the waters. He is friendly but passive, easy to enflame but his interest can fade as quick as it flamed up, at its worst even appear as fakery and falsiness. So the Knight of Cups may also appear as an unsteady character, full of unripe ideas and failed attempts.